Sad news this morning, Khun Ray, the Patriarch of Secrets Bar died suddenly in Chiang Mai last night. We understand he was taken ill whilst in Secrets bar last night. Ray, who was seventy eight, was looking forward to a brighter future having recently been in hospital for a cataract operation. 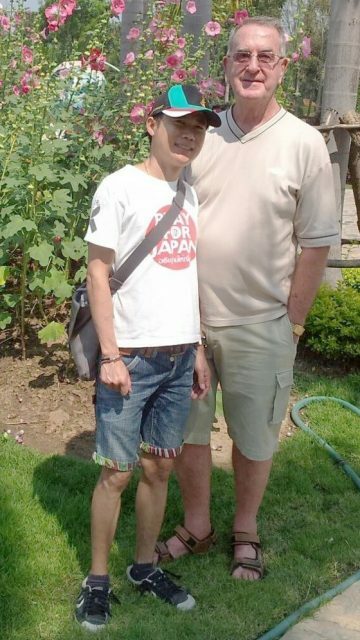 Our condolences and deepest sympathy to his long time partner Khun Oh. An Australian, Ray retired to Chiang Mai quite a few years ago after a distinguished career with Fed Ex. He was originally involved with the Lemongrass – a gay venue on Rajamankha Rd – which subsequently became Seven Suns (now closed). 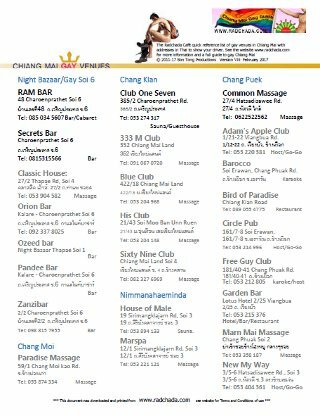 Subsequently, his partner Khun Oh, opened Secrets Bar at the Night Bazaar (Thapae Soi 1) more than ten years ago. Over the years Secrets bar has become one of Chiang Mai’s most liked gay venues and has moved several times (Read articles about Secrets Bar). It’s current incarnation on gay soi 6 being the fourth. Most evening’s Ray could be found sitting at the end of the bar enjoying a glass of red wine and was always amenable for a good chat with friends and customers. He will be sadly missed by many. Ray’s body will be moved today (Tuesday 8 August)to Wat Hua Fai (วัดหัวฝาย Geo: 18.773560, 98.993644 near the Mother and Baby hospital ) on Prachasamphan road. Prayers will start at 8p.m. tonight for three nights. The funeral will be held at the Crematorium on Prachasamphan road on Friday, time to be confirmed. To get to Wat Hua Fai from Changklan Rd, head south on Changklan from the intersection with Sridonchai Rd. After approx 100M Prachasamphan road forks off to the right (By Giorgio Restaurant). Continue along Prachasamphan road for approx 1KM passing straight across the traffic lights on the intersection with Ragang Rd. After the Mother and Baby hospital (on Left) the Wat will be in front of you. I always enjoyed a chat and a laugh with Ray at Secrets in its numerous incarnations. A good host and good fun and well liked. So sorry Khun O.